Welcome, Scouter and your family, to Troop 109! The troop, both young men and adults, has a lot to offer to you. Scouting can teach you a variety of life skills, not just camping, and you will have fun in the process. You will learn responsibility, grow stronger physically and mentally, and learn how to teach and lead others. If you desire it enough, this can take you to the ultimate accomplishment as a Boy Scout -- the rank of Eagle Scout, an award that few who join Scouting will achieve. Do YOU want to be one of those young men? In our troop, you will have help: lots of it! There is a group of adult and youth leaders, including your Scoutmaster, Assistant Scoutmasters, Senior Patrol Leader, and various others to answer all your questions and help you with your advancements. You will get back from our program everything you put in! You also have a youth leadership council that will be glad to help you. In our troop, you become a member of a patrol when you join us. This patrol is a group of boys your own age who work, compete, learn, cook, etc., together. You are an interdependent group where everyone is important. Your patrol is lead by a patrol leader, assistant patrol leader, and a patrol quartermaster that you elect. You will have the opportunity to run for these positions as you advance in rank through Scouter, Tenderfoot, 2nd Class and 1st Class. Your leader works through a Troop Guide that in turn is directed by an Assistant Scoutmaster assigned to your patrol. Your patrol will conduct periodic meetings to take care of your patrol's responsibilities, goals, and activities. You will plan and carry out assignments for the troop as designated by your Patrol Leader, Assistant Senior Patrol Leader (ASPL), and the Senior Patrol Leader (SPL), along with the Scoutmaster. This group, called the Patrol Leaders Council (PLC), meets monthly to develop the troop's program and calendar. Generally, there is a regular troop meeting from 7:00 PM until 8:30 PM on each Tuesday, except the first Tuesday of the month, which is reserved for the PLC meeting, which is scheduled from 6:30 PM until 7:30 PM. The troop committee meeting for the adults immediately follows the PLC meeting. Most of the regular meetings take place at the Fishers United Methodist Church located on the south side of 116th street, just east of interstate 69. Class A - The tan scout dress shirt with all approriate patches sewn on correctly. "Full class A" refers to the use of this shirt with the official BSA pants or shorts, belt, merit badge sash, and troop neckerchief with slide. Class B - The red knit shirt with embroidered Scouting emblem. Class C - Any official Scouting t-shirt. Classes A and B are acceptable for most troop meetings. The "Full Class A" uniform is required for formal events such as Courts of Honor, Boards of Review, inspections, public appearances, etc. At least a Class A shirt is required for working fund raiser shifts and traveling to and from campouts. Non-scouting shirts should not be worn in most instances. Your first source of information for anything in Scouts is your Boy Scout Handbook. In addition to being an informative guide to scouting, it is used to record completion of the steps required to advance in rank. It will be a part of your every Scouting activity. 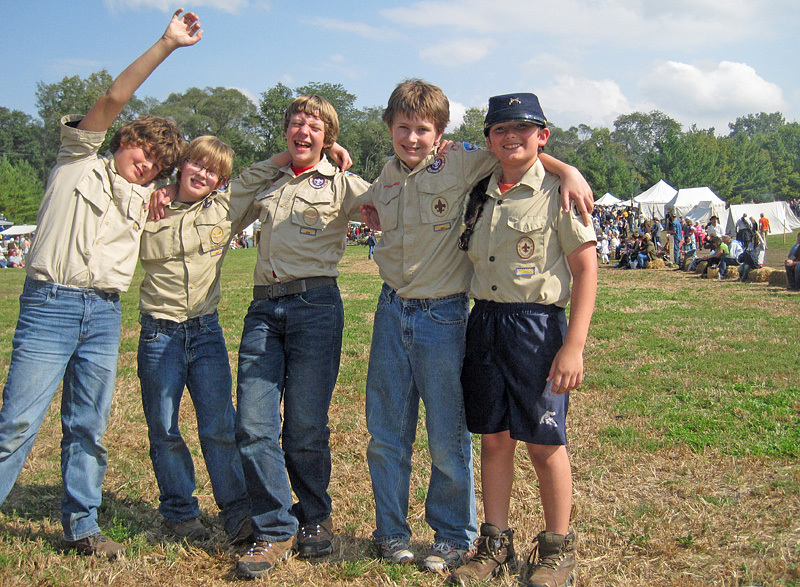 Yearly dues are collected at a scout's time of registration or when the troop is rechartered, usually in October. Recharter dues only finance some of the troop's undertakings, they do not pay for campouts or other individual activities. To help offset camping costs, each scout has a personal "scout account" funded by our major fundraisers. Both the scouts and parents need to participate in these in order to receive money from these fundraisers. Currently, these fundraisers include: the Fishers Freedom Festival in June, popcorn sales in October, and Christmas tree sales in December. If you participate actively in these fundraisers, your cost for the major outings can be completely covered. In addition, your son has the opportunity to put his Scouting knowledge to the test and earn the equivalent of his summer camp fees paid by the Firestone Rubber Company in Noblesville. This one-day event is usually the first Saturday in May. There will be opportunities for your son to earn merit badges as a group, but many are individual choices done with a counselor. To start a merit badge, find one you would like to earn in your Scout Book or in the back of merit badge books. Any young man grows up participating and learning many different things, which are usually the same items required by merit badges. The information learned while completing a merit badge will put you down the path to Eagle Scout at a much faster pace. Most importantly, parents, please support your son. Be a good listener and promote his positive activities like Scouting. Participate in various scout activities as a parent. Your help is important to keep the scout troop on a solid foundation and to provide scouts those things that they will not find in any other organization. To be sure, there are many distractions from all directions. As a parent you can help your son make the right decisions for himself. Scouting helps develop boys into great young men and future leaders of the community.